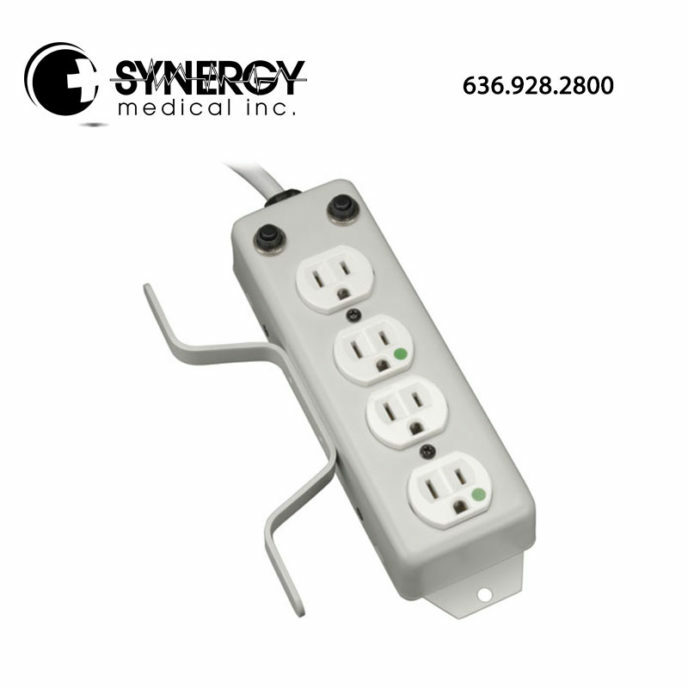 The Tripp Lite PS410HGOEMX Medical-Grade Power Strip supplies power to movable plug-connected components mounted to a rack, table or pedestal in operating rooms, patient-care vicinities, therapy rooms, imaging environments and administrative areas. Compliant with UL 1363A specifications, this 120V, 50/60 Hz power strip features a NEMA 5-15P-HG hospital-grade plug and four NEMA 5-15R-HG hospital-grade outlets. Two built-in resettable 15A circuit breakers control power to all outlets and protect the power strip against overloads. Switchless design prevents the unit from being accidentally shut off. The built-in cord wrap provides easy cord management in mobile applications. The drip shield can be mounted for extra protection when there are liquids in the environment. Mounting tabs and flanges let you install the Tripp Lite PS410HGOEMX on a wide variety of surfaces, such as IV poles, mobile carts, crash carts and mobile medical workstations. The all-metal housing ensures safety and is guaranteed to last a long time in demanding surroundings. For more information, please visit tripplite.com.